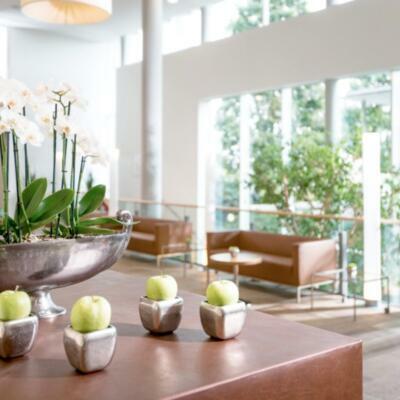 Our wellness tip: 3 relaxation days including a feel good massage, access to the spa, sauna, sports facilities and Oriental World with hammam, also on the arrival day and departure day included, breakfast until midday and much more besides! From now our sauna world will be closed for 5 months because of a total conversion. The public spa including all basins as well as all relaxation rooms in this area are available as usual. 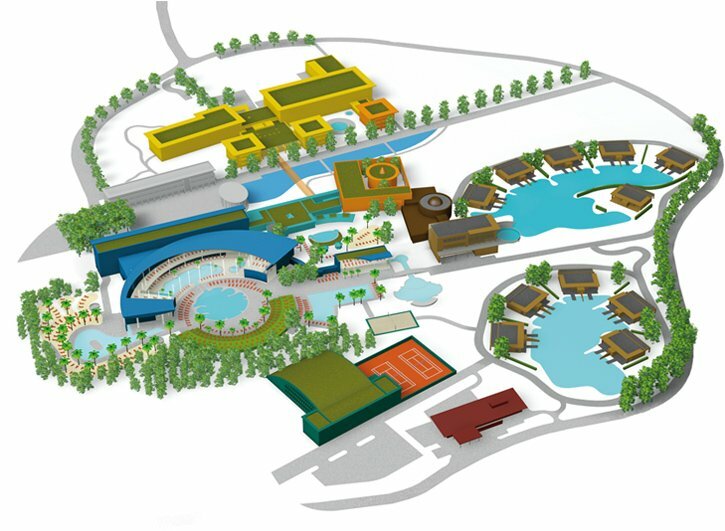 Just click on the numbers to learn more about all the different areas of our resort. 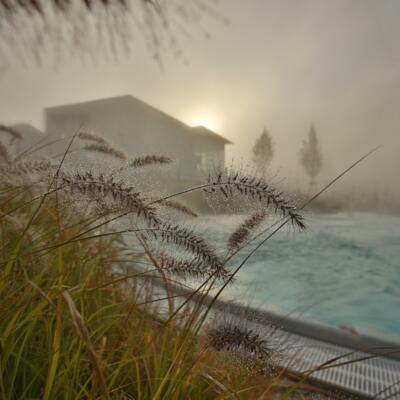 Buy your preferred pass on site at the spa payment desk and enjoy our 3 Water Worlds, as well as our Sauna World. 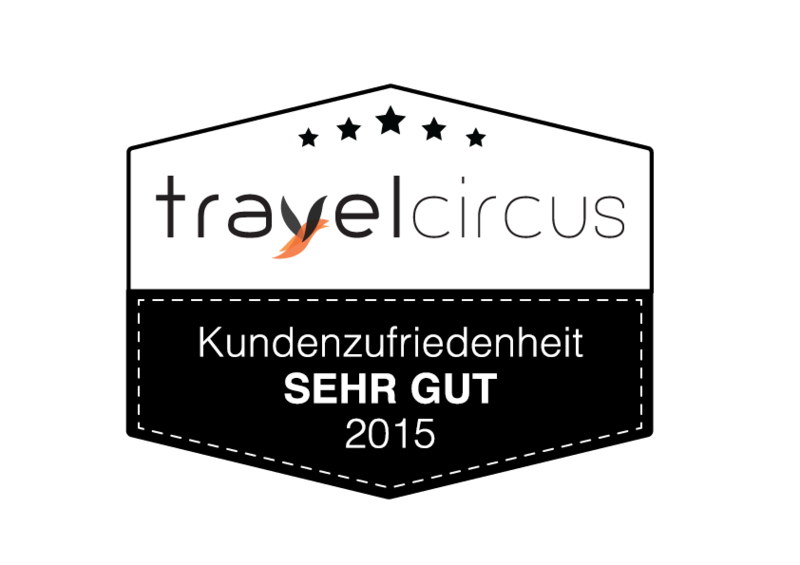 Find out about current offers, prices, opening hours etc. 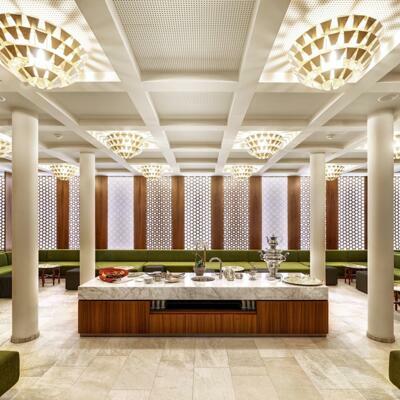 Enjoy healthy and fresh tasty food, salads and much more in the Market Restaurant within the Spa. 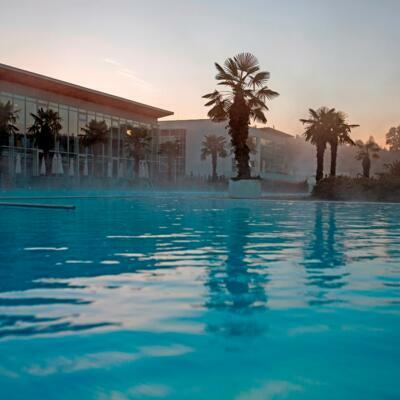 At over 420m², the heart of Therme Geinberg SPA Resort. 36°C thermal spring water. 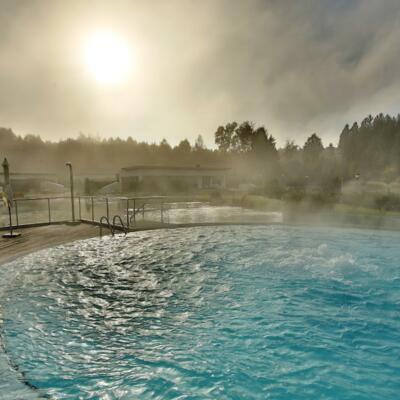 Relaxation and pure wellness in the open air with 36°C thermal spring water. The Caribbean lagoon lets you drift you away to a blissful exotic world with gentle underwater music all year round. The salt in the water pampers and soothes the skin. In summer, the palm trees and white sandy beach conjure up a relaxed holiday atmosphere. This bar is open from Sunday to Thursday from midday until 8pm, Friday and Saturday until 9pm. During the summer months, it is located in the Caribbean lagoon, and in winter or in bad weather it is in the indoor area. Our quiet room in the Caribbean lagoon means guaranteed pure relaxation! Refreshing for guests wanting to swim a few lengths. Fresh water heated to 26°C. Cosy relaxation across several levels out in the fresh air. 36°C thermal spring water. Enjoy relaxing warmth and soft light with views of the resort. 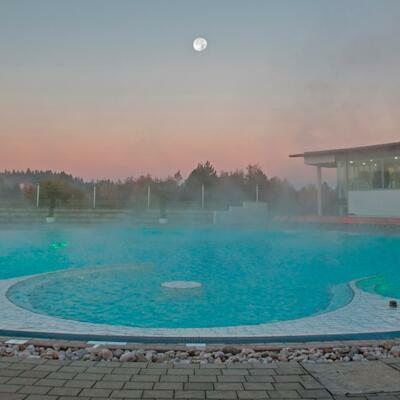 The spacious Sauna World has eleven saunas and steam rooms to offer you. 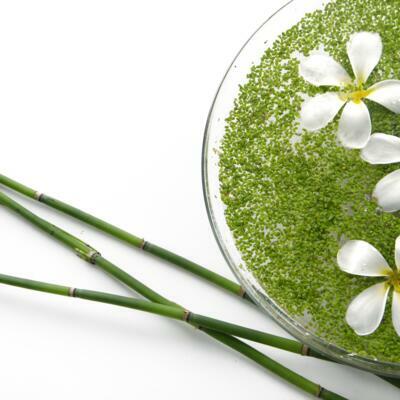 Enjoy the various scheduled infusions and feel how everyday stresses and strains simply melt away. Make the most of individual therapies, treatments and check-ups for improved health, beauty and well-being. 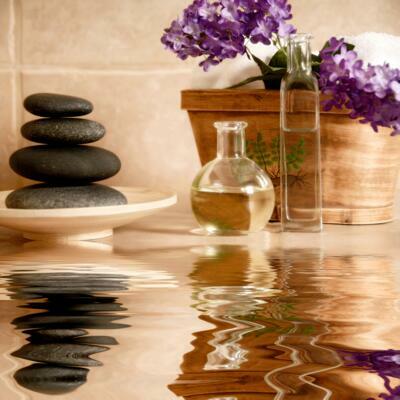 With a floatarium, Dead Sea salt grotto and treatments, such as Ayurveda, Alpienne and much more. Spa goers can explore the mysterious world of Arabian Nights in the Oriental World. 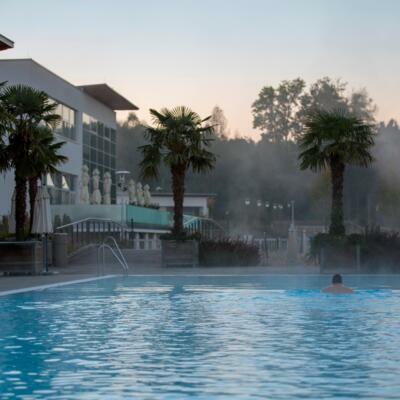 Indulge in all the magic of the Orient and discover the Therme Geinberg SPA Resort’s new Oriental World. Welcome to a refuge where sensations are cherished and where dreams become an experience, an oasis which soothes and refreshes body and mind. We are at your disposal every day around the clock, or you can ring us on extension 38 or 37. Enjoy your afternoon tea, an apéritif, a heavenly cocktail and selected wines in our cosy bar. Our hotel bar is open to guests from 9am. 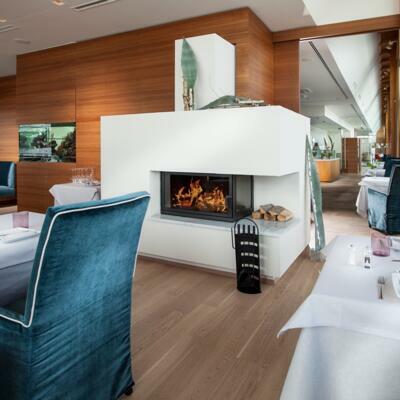 You are assured Austrian hospitality and healthy, tasty pleasure in our elegant non-smoking restaurant in the Vitalhotel. Enjoy our 5-course gourmet menu, or choose our buffet from 6pm until 9pm! Depending on the number of conference or seminar participants, we can offer you different rooms and customise them to your individual specifications! We can offer you the highest quality for cutting-edge seminars, with a separate seminar reception, and with competent staff who are always available. Your conference room for events for up to 80 people. You’ll love our spacious 450 m² gym with high quality Technogym equipment and one-to-one advice from our fully qualified personal trainers. Sports centre with 2 open-air tennis courts and 2 indoor tennis courts. Enjoy culinary delights in AQARIUM, our multi-award-winning restaurant, with its spacious terrace beside the lily pond. In the lobby bar (smoking area) you can enjoy one of our speciality apéritifs. 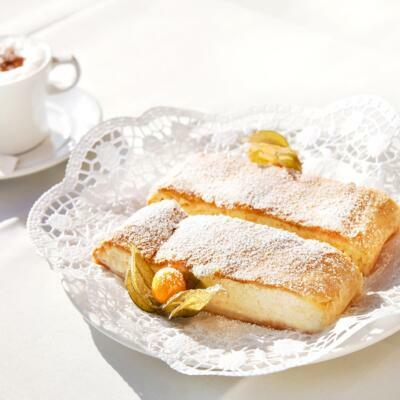 Find out all about on the Innviertel region’s unspoilt countryside at the Tourismusverband s´Innviertel Tourism Association. 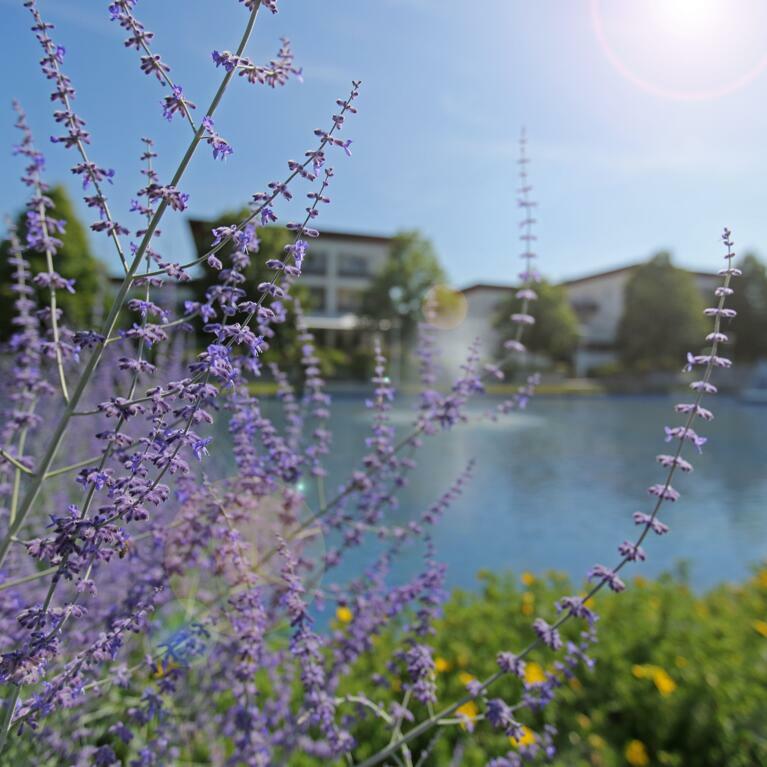 Calm lakes and sun-drenched forests make up your relaxation space,from the Inn river to the Kobernausser forest uplands. Simply Private. Welcome to Geinberg5, the exclusive retreat for your private wellness experience. The exclusive SPA is only available to Geinberg5guests. Enjoy the plush indoor and outdoor swimming facilities, complete with massage jets, then chill out in the stylish relaxation and lounge areas, spread across two floors. We serve delicious light snacks and drinks directly to your lounger. We are at your disposal every day from 7am to 10:30pm.